The Congress party neither disclosed the letter nor the fact that whether the meeting Anil Ambani sought from the Congress President ever took place, and what transpired in that meeting if at all. 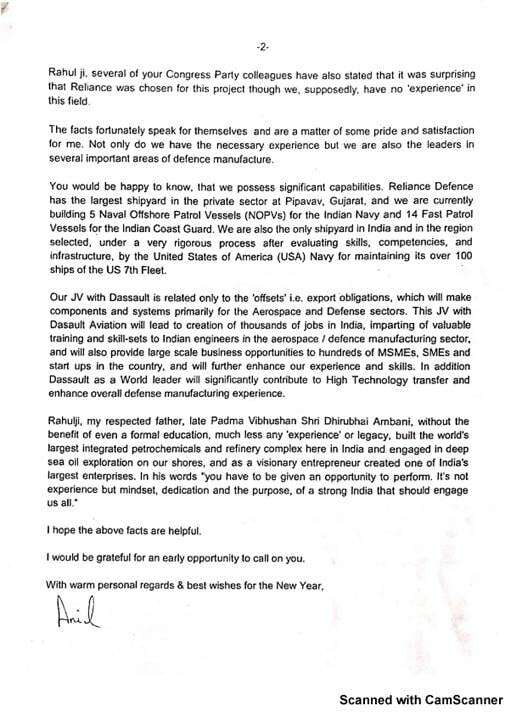 Days after Congress President Rahul Gandhi's thundering speech in Parliament where he took on Prime Minister Modi and Defence Minister Nirmala Sitharaman over the Rafale deal, BusinessToday.In has got access to a letter Reliance Anil Dhirubhai Ambani Group Chairman Anil Ambani had written to the Congress chief back in December 2017. Anil Ambani justified his selection for the JV on the grounds that his company, Reliance Defence Limited, is the leader in several defence areas and has the largest shipyard in the private sector. The company is involved in the construction of five Naval Offshore Patrol Vessels for the Indian Navy and total 14 Fast Patrol Vessels for the India Coast Guard, he wrote. 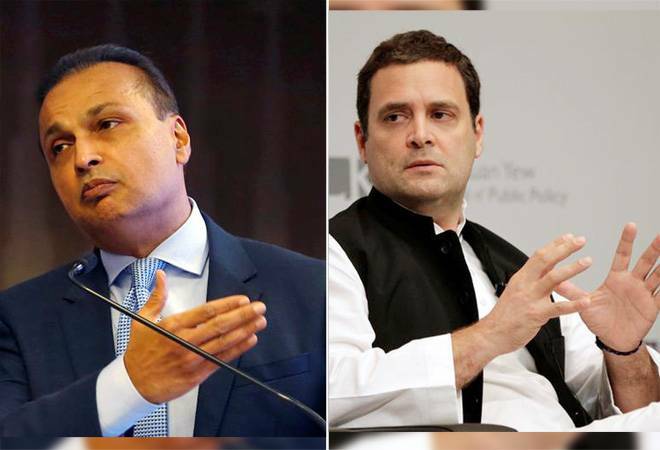 The Congress party had neither disclosed that it received the letter from Anil Ambani nor the fact that whether the meeting Anil Ambani sought from the Congress President ever took place, and what transpired in that meeting if at all. 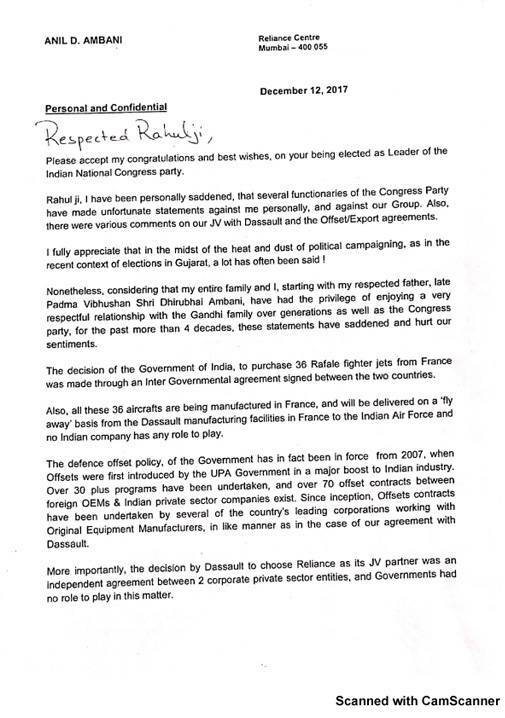 In the letter, Ambani said he was "personally saddened" over the Congress party's allegations against the Narendra Modi government for choosing his company for the Dassault Reliance aerospace joint venture. Under the deal between India and France, India would buy 36 Rafale fighter jets from France, and as part of the offset obligation, the French Dassault Aviation would invest 100 million euros in India to make the components for the fighter jets and Falcon civilian aircraft. Giving reference to Rahul Gandhi's poll campaign rallies before the Assembly elections in Gujarat in December -- in which he criticised the government for favouring Anil Ambani's company Reliance Defence, which he claimed had "nil experience" for the contract -- Anil Ambani said the deal was made through a pact signed between both the countries, and that these aircraft would be built in France, only to be delivered to the Indian Air Force on 'fly away' basis. He said no Indian company had any role to play in the process. Rahul Gandhi in November 2017 had asked PM Modi to explain his "Reliance on someone with nil experience in aerospace for the Rafale deal?" Through a series of sarcastic tweets, Rahul had accused that "Self 'Reliance' is obviously a critical aspect of Make in India". Talking about the offset policy -- a mechanism to drive defence manufacturing in India -- Anil Ambani wrote to Gandhi that it had been in force since 2007 when the UPA government first introduced offsets to boost the Indian defence industry. "Over 30 plus programmes have been undertaken, and over 70 offset contracts between foreign OEMs and Indian private sector companies exist," said the letter released on December 12. Ambani said since the inception of the offset clause, several contracts had been undertaken by leading corporations working with original equipment manufacturers just like the agreement with Dassault Aviation. Over the allegations of the Modi government favouring Reliance Defence for the Rafale deal, Anil Ambani said the decision to choose his company as a joint venture partner was an independent agreement between the two companies, and that the government of India had no role to play in it. Expressing surprise that several Congress members had raised objection over his company's selection for the project, Ambani said his company not only had the necessary experience but was also the leader in several major defence areas. "Reliance Defence has the largest shipyard in the private sector at Pipavav, Gujarat, and we are currently building five Naval Offshore Patrol Vessels for the Indian Navy and 14 Fast Patrol Vessels for the India Coast Guard," said Ambani. The company's shipyard is the only one in India selected under a rigorous process by the US Navy for maintaining over 100 ships of the US 7th Fleet. He said Reliance JV with Dassault was only related to offsets i.e. export obligations, under which his company will make components and systems, primarily for the aerospace and defence sectors. Ambani said the joint venture would not only create thousands of jobs in India but would impart necessary skills to engineers in aerospace and defence manufacturing. Besides, several MSMEs, SMEs, and start-ups would also benefit from business opportunities this deal would produce, he said. The timing to incorporate Reliance Defence does not correspond with the deal but with Modi's announcement that India wants to acquire aircraft from France. While the inter-government deal between the two countries was initiated on March 28, 2015, the final deal was signed on September 23, 2016. However, the joint venture between both the companies was formed on December 16, 2016, two months after the deal. But what's interesting is that Modi announced the Rafale deal on Apr 10, 2015, during his France visit, 13 days after the Reliance Defence was set up there. At that time, nobody knew Reliance would get this deal. Meanwhile, invoking his family's relationship with the Gandhi family over generations, Anil Ambani said his entire family, including his late father Dhirubhai Ambani, enjoyed a respectful relationship with the Gandhi family and the Congress party at large, and that such statements had hurt their sentiments. Here is the full version of the letter issued on December 12, 2017.